The word ascites is of Greek origin (askos) and means bag or sac. Ascites describes the condition of pathologic fluid collection within the abdominal cavity. Healthy men have little or no intraperitoneal fluid, but women may normally have as much as 20 mL, depending on the phase of their menstrual cycle. This article focuses only on ascites associated with cirrhosis. This computed tomography scan demonstrates free intraperitoneal fluid due to urinary ascites. For patient education resources, see Digestive Disorders Center and Heart Health Center, as well as Cirrhosis, Hepatitis B (HBV, HepB), Hepatitis C, and Congestive Heart Failure. Three theories of ascites formation have been proposed: underfilling, overflow, and peripheral arterial vasodilation. The underfilling theory suggests that the primary abnormality is inappropriate sequestration of fluid within the splanchnic vascular bed due to portal hypertension and a consequent decrease in effective circulating blood volume. This activates the plasma renin, aldosterone, and sympathetic nervous system, resulting in renal sodium and water retention. The overflow theory suggests that the primary abnormality is inappropriate renal retention of sodium and water in the absence of volume depletion. This theory was developed in accordance with the observation that patients with cirrhosis have intravascular hypervolemia rather than hypovolemia. The most recent theory, the peripheral arterial vasodilation hypothesis, includes components of both of the other theories. It suggests that portal hypertension leads to vasodilation, which causes decreased effective arterial blood volume. As the natural history of the disease progresses, neurohumoral excitation increases, more renal sodium is retained, and plasma volume expands. This leads to overflow of fluid into the peritoneal cavity. The vasodilation theory proposes that underfilling is operative early and overflow is operative late in the natural history of cirrhosis. Although the sequence of events that occurs between the development of portal hypertension and renal sodium retention is not entirely clear, portal hypertension apparently leads to an increase in nitric oxide levels. Nitric oxide mediates splanchnic and peripheral vasodilation. Hepatic artery nitric oxide synthase activity is greater in patients with ascites than in those without ascites. Regardless of the initiating event, a number of factors contribute to the accumulation of fluid in the abdominal cavity. Elevated levels of epinephrine and norepinephrine are well-documented factors. Hypoalbuminemia and reduced plasma oncotic pressure favor the extravasation of fluid from the plasma to the peritoneal fluid, and, thus, ascites is infrequent in patients with cirrhosis unless both portal hypertension and hypoalbuminemia are present. Healthy men have little or no intraperitoneal fluid, but women may normally have as much as 20 mL, depending on the phase of their menstrual cycle. The prognosis for patients with ascites due to liver disease depends on the underlying disorder, the degree of reversibility of a given disease process, and the response to treatment. The most important aspect of patient education is determining when therapy is failing and recognizing the need to see a physician. Unfortunately, in most cases, liver failure has a dismal prognosis. All patients must be taught which complications are potentially fatal and the signs and symptoms that precede them. Abdominal distention and/or pain despite maximal diuretic therapy are common problems, and patients must realize the importance of seeing a physician immediately. Pericleous M, Sarnowski A, Moore A, Fijten R, Zaman M. The clinical management of abdominal ascites, spontaneous bacterial peritonitis and hepatorenal syndrome: a review of current guidelines and recommendations. Eur J Gastroenterol Hepatol. 2016 Mar. 28(3):e10-8. [Medline]. Fede G, D'Amico G, Arvaniti V, et al. Renal failure and cirrhosis: a systematic review of mortality and prognosis. J Hepatol. 2012 Apr. 56(4):810-8. [Medline]. Weniger M, D'Haese JG, Angele MK, Kleespies A, Werner J, Hartwig W. Treatment options for chylous ascites after major abdominal surgery: a systematic review. Am J Surg. 2016 Jan. 211(1):206-13. [Medline]. Wallerstedt S, Olsson R, Simren M, et al. Abdominal tenderness in ascites patients indicates spontaneous bacterial peritonitis. Eur J Intern Med. 2007 Jan. 18(1):44-7. [Medline]. Tapper EB, Bonder A, Cardenas A. Preventing and treating acute kidney injury among hospitalized patients with cirrhosis and ascites: a narrative review. Am J Med. 2016 May. 129(5):461-7. [Medline]. Han CM, Lee CL, Huang KG, et al. Diagnostic laparoscopy in ascites of unknown origin: Chang Gung Memorial Hospital 20-year experience. Chang Gung Med J. 2008 Jul-Aug. 31(4):378-83. [Medline]. [Full Text]. Wong CL, Holroyd-Leduc J, Thorpe KE, Straus SE. 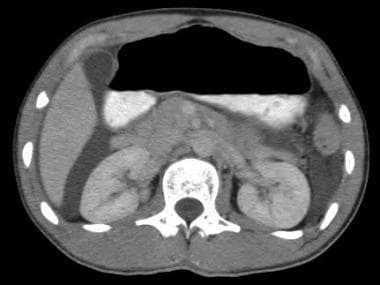 Does this patient have bacterial peritonitis or portal hypertension? How do I perform a paracentesis and analyze the results?. JAMA. 2008 Mar 12. 299(10):1166-78. [Medline]. [Guideline] Runyon BA, American Association for the Study of Liver Diseases. Management of adult patients with ascites due to cirrhosis: update 2012. National Guideline Clearinghouse. Available at http://guideline.gov/content.aspx?id=45103&search=ascites. Accessed: Nov 6, 2014. Gines P, Cardenas A. The management of ascites and hyponatremia in cirrhosis. Semin Liver Dis. 2008 Feb. 28(1):43-58. [Medline]. Gines P, Wong F, Watson H, et al, for the HypoCAT Study Investigators. Effects of satavaptan, a selective vasopressin V(2) receptor antagonist, on ascites and serum sodium in cirrhosis with hyponatremia: a randomized trial. Hepatology. 2008 Jul. 48(1):204-13. [Medline]. Bellot P, Welker MW, Soriano G, et al. Automated low flow pump system for the treatment of refractory ascites: a multi-center safety and efficacy study. J Hepatol. 2013 May. 58(5):922-7. [Medline]. Sola-Vera J, Minana J, Ricart E, et al. Randomized trial comparing albumin and saline in the prevention of paracentesis-induced circulatory dysfunction in cirrhotic patients with ascites. Hepatology. 2003 May. 37(5):1147-53. [Medline]. [Full Text]. Lata J, Marecek Z, Fejfar T, et al. The efficacy of terlipressin in comparison with albumin in the prevention of circulatory changes after the paracentesis of tense ascites--a randomized multicentric study. Hepatogastroenterology. 2007 Oct-Nov. 54(79):1930-3. [Medline]. Mercadante S, Intravaia G, Ferrera P, Villari P, David F. Peritoneal catheter for continuous drainage of ascites in advanced cancer patients. Support Care Cancer. 2008 Aug. 16(8):975-8. [Medline]. Courtney A, Nemcek AA Jr, Rosenberg S, et al. Prospective evaluation of the PleurX catheter when used to treat recurrent ascites associated with malignancy. J Vasc Interv Radiol. 2008 Dec. 19(12):1723-31. [Medline]. Sorrentino P, Castaldo G, Tarantino L, et al. Preservation of nutritional-status in patients with refractory ascites due to hepatic cirrhosis who are undergoing repeated paracentesis. J Gastroenterol Hepatol. 2012 Apr. 27(4):813-22. [Medline]. Guo TT, Yang Y, Song Y, Ren Y, Liu ZX, Cheng G. Effects of midodrine in patients with ascites due to cirrhosis: Systematic review and meta-analysis. J Dig Dis. 2016 Jan. 17(1):11-9. [Medline]. Seike M, Maetani I, Sakai Y. Treatment of malignant ascites in patients with advanced cancer: peritoneovenous shunt versus paracentesis. J Gastroenterol Hepatol. 2007 Dec. 22(12):2161-6. [Medline]. Conti L, Baldini E, Capelli P, Capelli C. Bowel obstruction in obturator hernia: A challenging diagnosis. Int J Surg Case Rep. 2017 Dec 7. 42:154-7. [Medline]. Chiejina M, Samant H. Ascites. StatPearls. 2017 Nov 21. [Medline]. [Full Text]. Disclosure: Received consulting fee from Takeda for speaking and teaching.